As things start to get vicious and Klaus’ hybrid instincts kick in, fear and shock are in Rebekah and Marcel’s eyes. Klaus yells for Marcel to finish it off as he keeps murdering every single vampire that gets in his way. Rebekah fearing for Marcel’s life tells him to take the coin, save himself and stop the fighting. Finally Marcel picks up the coin and declares himself to Klaus. Elijah continues to hallucinate and goes into his own memories of long ago. Flashbacks of Klaus killing people in New Orleans and Elijah trying to make him stop, Klaus has sent to gather all the witches to be burned and this is where Celeste comes in play. When he semi gets back to real life he starts attacking Hayley thinking she is Klaus but gets stopped by a ware wolf who happens to be part of her family. She goes on to explain why she decided to get rid of her wolf mark to avoid death and Marcel. Back at the compounds of Marcel, death as overcome many vampires and a ceremony is in place. Marcel tells Klaus that if he’s going to kill him to do it. He tells him that he can have all of it, the land, New Orleans but one thing he will never have is loyalty. One thing that Klaus never taught him. Hayley continues to wonder what became of Celeste and asks to see what happened. Flashback of Celeste dying in a tub and Elijah crying appear. Hayley asks why he fights so hard to change Klaus when his family is so torn. Elijah tells her that all he wants it to fix his family, he has eternity and that everyone that he cares for gets hurts. Things get super emotional when Klaus gets back home and Rebekah asks who he’s going to dagger to punish for what they’ve done. Elijah walks in and and tells him to stop. Klaus tells him that this has everything to do with Hayley, that since she adores Elijah his baby will grow up calling Elijah father. Rebekah stops him and tells him that doesn’t he understand that they will not leave him, Klaus just pushes them away. 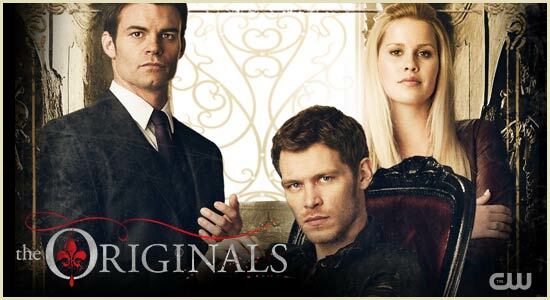 Klaus says that history repeats itself, that they end up siding with his enemies and never believing in him. Now that Klaus has his homeland back he tells them that they can stay there and rot. Tears falling from Klaus’ eyes and his brother and sister left behind, he walks out and tells Hayley that she is coming with him since the baby is the only thing that he cares about. Back at the church where Father Kieran and Cami are, Cami talks to her uncle about her blackouts and that maybe she was trying to send herself a message. After doing some research she discovers an old newspaper clipping from 1919 where Klaus and Marcel are together. She is in shock and tells her uncle that she knows those men! And just when it’s getting good we’re left to wonder what will happen next. What were your thoughts on this week’s episode? Can’t Klaus just love his family?